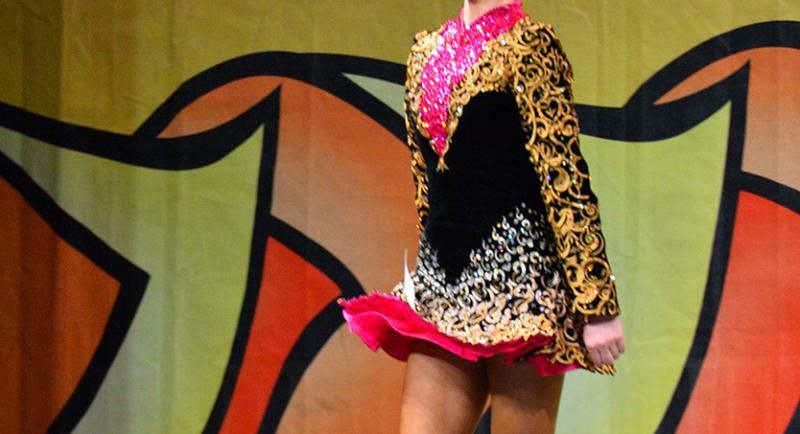 dance.net - Beautiful Doire Dress worn by u14/u15 dancer (10246062) - Read article: Ballet, Jazz, Modern, Hip Hop, Tap, Irish, Disco, Twirling, Cheer: Photos, Chat, Games, Jobs, Events! 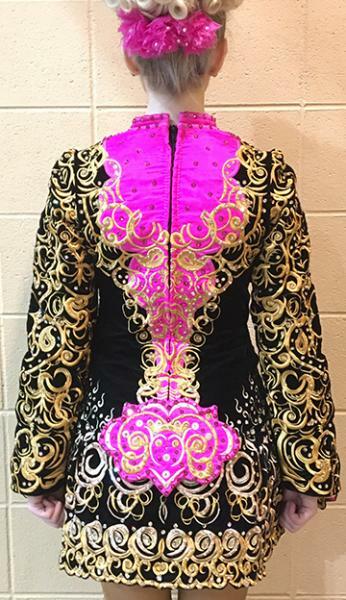 Exquisitely embroidered Shauna Shiels Doire dress in black & gold with highlights of pink. Black lightweight velvet dress with intricate embroidery. Skirt features gold embroidery which ombres up into white. Sleeves, back and bodice are filled with beautiful filigree gold embroidery. Dress features a highlight pink v-neckline, back and cape, as well as a pink underskirt that really pops when the dancer kicks and leaps. Dress, cape and matching pink tiara are detailed with thousands of Swarovski rhinestones in golden shadow, silk, crystal and fuschia. Skirt is also adorned with several pear-shaped golden shadow Swarovski crystals. Tiara has several crystal pear-shaped Swarovski stones. Room for let out at the zipper and let down at the skirt. Dress includes accompanying cape, tiara, custom made matching pink ribbon flower strip for the back of the bun and pink bloomers. Dress was made June 2016 for NANs. Must be paid in full in US funds. Measurements taken with the dress on the dancer. Shipping included for USA, overseas shipping extra. Will accept return (within three days) and refund dress price for USA buyer however, buyer to pay all shipping costs with return. Overseas returns are negotiable. Fits U.S. girls size 14-16 up to junior size 0-1. Worn by u14/u15 dancer. Across the shoulders: 12 1/2"
Skirt on center: Front: 7"; Back: 8 3/4"
Price reduced to $1,600. 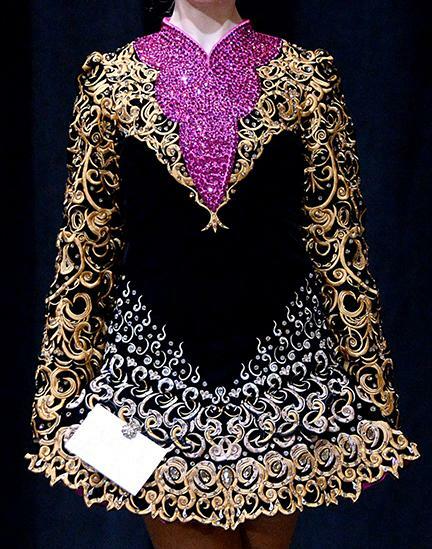 Dress will be at the Mullane Godley Feis. Reduced to $1,500. Dress will be available in the NAIDC Dress Shop in New Orleans at NANs.